When stylist Edward Enninful assumed the helm of British Vogue as its first-ever Black and male editor-in-chief, a lot of promises were made; the biggest being an improvement — nay, a total revamp — of how the magazine features diversity. From its staff to its covers, most of what stood stale and pale under former editor Alexandra Shulman's reign would be reversed. Enninful's first cover, a celebration of Britain, was a hit, featuring Ghanaian-British model Adwoa Aboah and a provocative hashtag, #NewVogue. But every cover after, featuring subjects as white as Taylor Swift, fell flat. But on Friday, with its May cover, British Vogue feels new again. 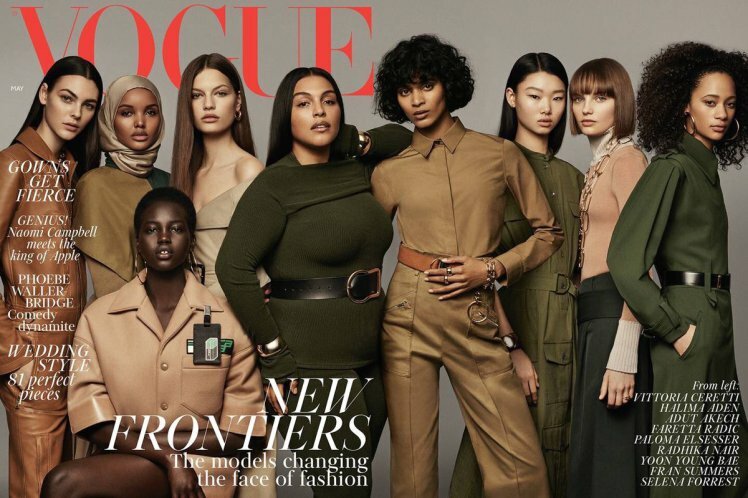 Titled 'The New Frontiers,' the cover features a throng of the industry's top models, ranging from Latina model Paloma Elsesser, Indian model Radhika Nair, Adut Akech of South Sudan, Vittoria Ceretti, and more. And it makes history with Halima Aden becoming the first hijab-wearing model to front the British edition in 101 years. Of the belated moment, Enninful says he hopes the nine trailblazers, shot by Craig McDean for the issue, are a reflection of what the future of British Vogue looks like. And he responds to those who've called the editor out for his soft approach to the racial diversity he sought to highlight last year. "When I say diversity, I want to be clear that it is never just about black and white for me," he writes. "It’s about diversity across the board — whether that’s race, size, socio-economic background, religion, sexuality. That’s what I want to celebrate with this cover." Just two months ago, its February issue took particular criticism when it featured Nicole Kidman and Margot Robbie on its cover with the headline: "Why We Need To Talk About Race." As to be expected, Twitter wasted no time in letting him have it and accused the editor of whiteness. Amongst the aforementioned trailblazers, Enninful sees the cover as a promising start to the future careers of Faretta Radic, Yoon Young Bae, Fran Summer, and Selena Forrest, too. As for the rest of the industry, we find ourselves optimistic once again that the May issue marks yet another turn for British Vogue; the new chapter its readers were assured was written and ready to hit newsstands.